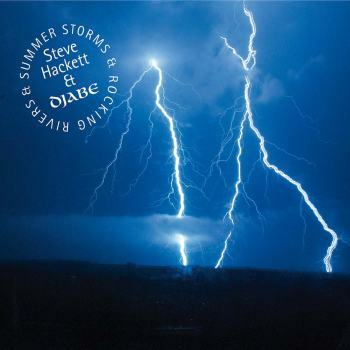 Summer Storms & Rocking Rivers is a release on CD and DVD featuring the collaborative relationship between Steve Hackett and the Hungarian jazz rock band Djabe. Strangely enough, for many years available on vinyl only. It is by no means the first weapon of the ex-Genesis guitarist and his Slavian friends. As of 2007 Hackett travels to the band for a number of concerts or a mini-tour every year. That has resulted in three live albums, and the gentlemen are also heard on each other's studio podcasts for a guest role. The concert on this release was done on July 14, 2011 in Bratislava and takes about one and a half hours. That is if you have the DVD version. The CD version last almost 80 minutes and has less titles on it. It's musically all right and it's always good to see and hear good musicians at work. Whoever loves Hackett's impressive guitar freaks and likes a jazzy glow is in for a real treat watching and hearing the recordings of this concert. This combination knows how to mix songs from Hackett's solo work and some Genesis tracks with Djabe's material. It goes from The Steppes to Ace Of Wands and Firth Of Fifth via Blood On The Rooftops to In That Quiet Earth. The final of Los Endos in Budapest closes the album, to name a few points of recognition. The arrangements are special and Hackett has no problems with that obviously. Often the solo's originally performed on the flute or synthesizers are replaced by instruments such as a violin or trumpet. It's a matter of personal taste if you are into these kind of arrangements. For example the intro of Firth Of Fifth is done on a violin and the beginning of Ace Of Wands on a trumpet. The songs move this way more towards the style Djabe has in their repertoire. So not only progressive rock is on the menu! We hear a mix of jazz rock, world music, blues and fusion, which, although it is quite virtuoso, is nowhere high-pitched. Tamás Barabás (bass guitar), Attila Égerházi (guitar, percussion), Ferenc Kovács (trumpet, violin, vocal), Szilárd Banai (drums) and Zoltán Kovács (keyboards) are all very gifted musicians and certainly do know how to play their instruments. Their musicianship is of a very high level and therefore it isn't so strange that Steve Hackett worked with them for several years already. Throughout the concert you can hear the fruits of their collaboration and you wonder how they could come up with such strong and above all strange arrangements of well known tunes in the fields of progressive rock. During the entire concert you are entertained throughout. That is if you can handle the style of music the musicians on stage are playing. The balance between up tempo songs and more mellow pieces is perfect. So I guess you can't ask for anything more can you? Well unless you want an encore. This you can find on the extras of the DVD. The DVD has three extras. First of all, there is an implementation of Jacuzzi/ Overnight Sleeper by Hackett and the Hungarian Symphony Orchestra led by Zoltán Kovács. Secondly, there is a black and white video clip of the song Tears For Peace in which we see the band making a trip through the city sitting on a tank. An example of how great this collaboration between Hackett and the band can be. Thirdly, there is a 21-minute documentary. It contains images of rehearsals, sound checks and performances. It is the famous work and yet it is always nice to see. All in all a very nice release which will make fans of Steve Hackett very happy. Although the DVD is not of the same standard as we get nowadays from Hackett's concerts it is still very enjoyable to watch. And the audio is remarkably good with a lot of room for details. So get it when you can! Most of all if you like progressive rock mixed with jazz rock, world music, blues and fusion.